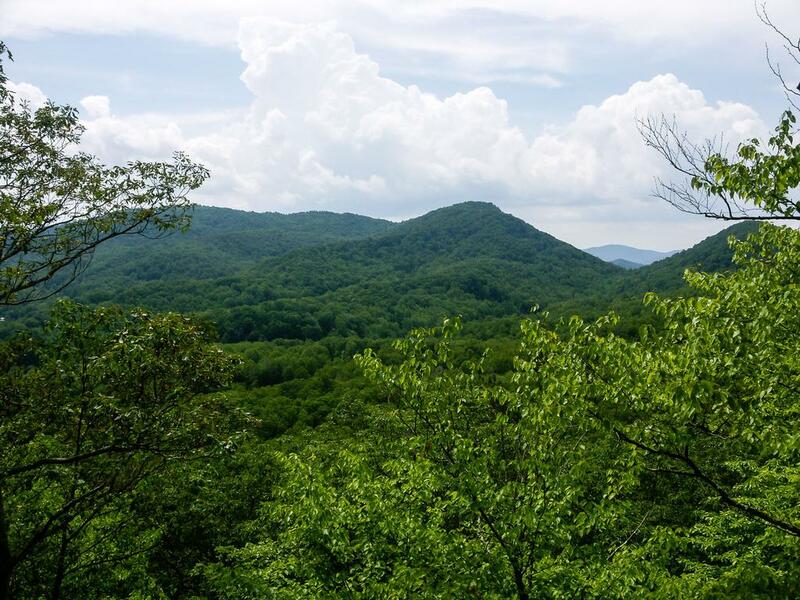 Located between Chimney Rock and Gerton, NC, at the upper end of the Hickory Nut Gorge, the Florence Nature Preserve was finished being acquired by the Carolina Mountain Land Conservancy in 2001. With the help of Dr. Tom and Glenna Florence, over 600 acres of land were placed under protection from development. A view from the overlook on the Red trail in Florence Preserve. 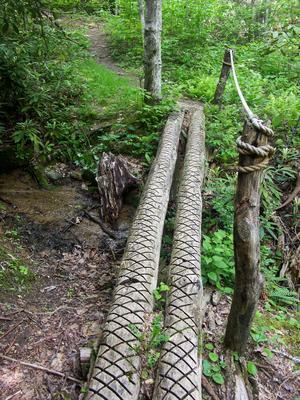 Log and Rope Bridge over Stream in Florence Preserve. The tract was not open to the public at first, and until recently, finding parking nearby was difficult. 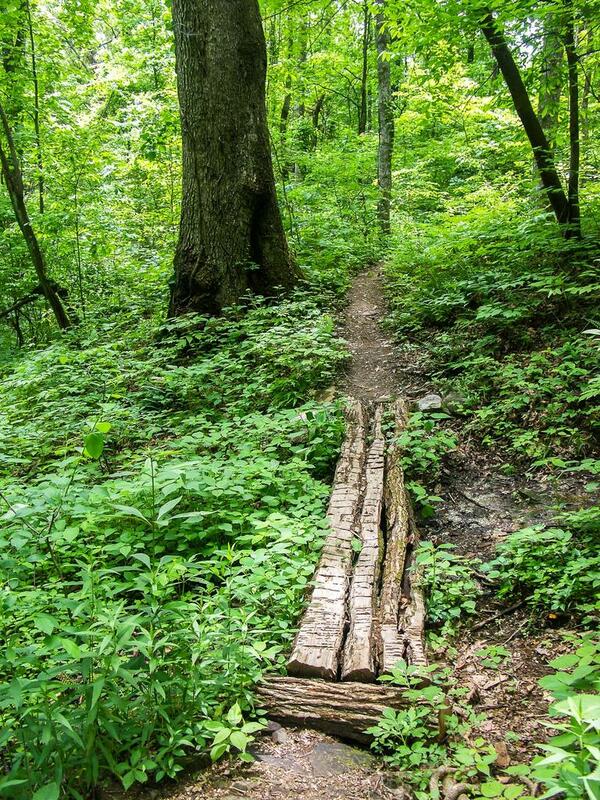 But now, a new parking area has been opened as the Upper Hickory Nut Gorge Trailhead, and an excellent connector trail takes visitors into the preserve. 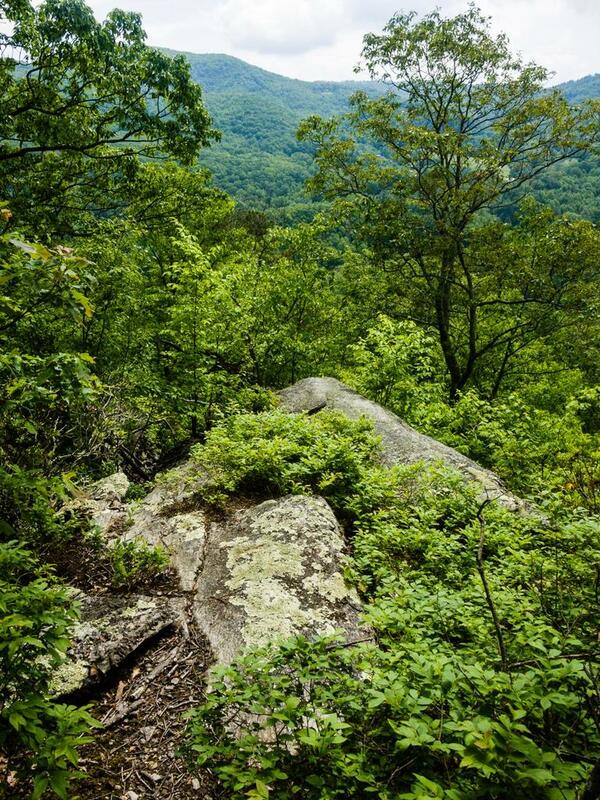 This has become a great hiking destination not too far from Asheville, NC - and a great free alternative to Chimney Rock Park for hiking in the Hickory Nut Gorge area. A fairly extensive network of trails winds throughout the preserve. A couple of sections are tied together with gravel roads. None of the trails are officially named, but usually they are referred to by the color on the map (and on the blazes). However - there are duplicate colors, so I'll throw in additional info to identify trails when referring to them. The yellow connector trail which connects the parking area to the blue trail is a brand-new, well-constructed alternative to the old, steep, eroded path which used to serve the same purpose. 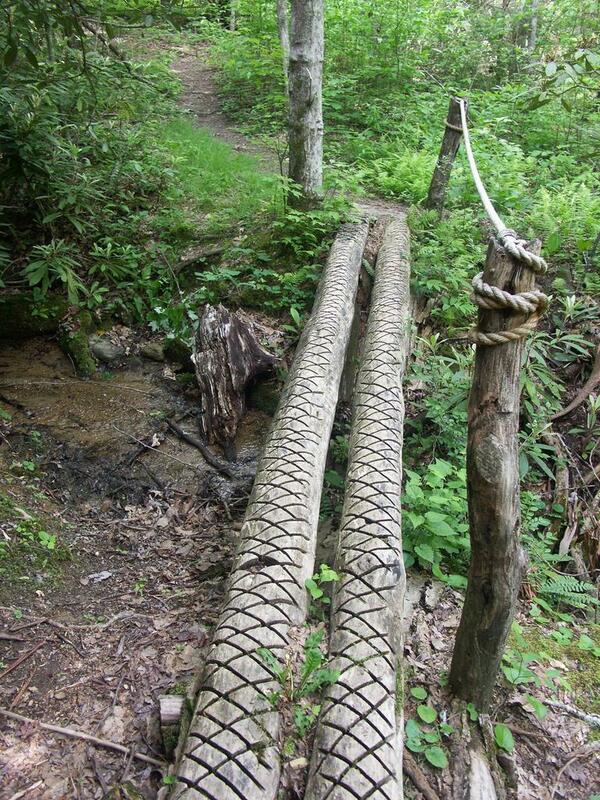 This trail is expertly routed past some neat features. Although steep near the bottom, it's moderate overall. 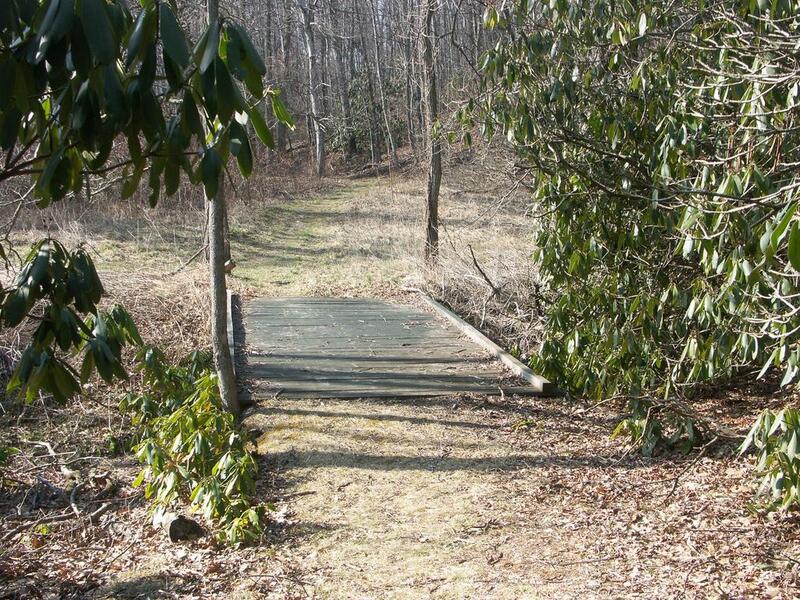 Old bridge and meadow in Florence Preserve. The blue trail climbs from the old parking area on Kelly Mountain Road, up alongside the main creek in the preserve, crossing it several times, before traversing the upper end of a ridge and going into the next creek valley. It ends at a gravel road. The red trail climbs from Kelly Mountain Road up the ridge to the west of the blue trail, intersecting with it near the its top. The white trail climbs from the blue trail, up over the ridge and intersecting the red trail, before descending into the next creek valley and ending on a gravel road. There are three orange trails, two of which are spur trails. 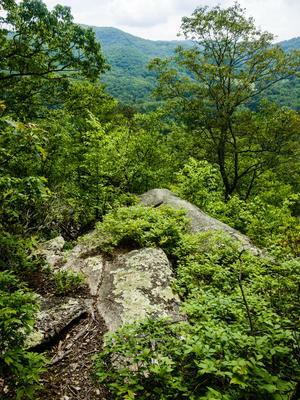 The one connecting to the Blue trail leads to Little Pisgah Point, a rock outcropping beneath the canopy (there are no views there). Another, which connects to the Red trail, leads to an overlook facing southwest with some nice views. The third connects two points on a gravel road with a ridge-top hike. Two more yellow trails are in the preserve - one connects the white trail to the blue trail on an old road bed; the other leads down to a creek. 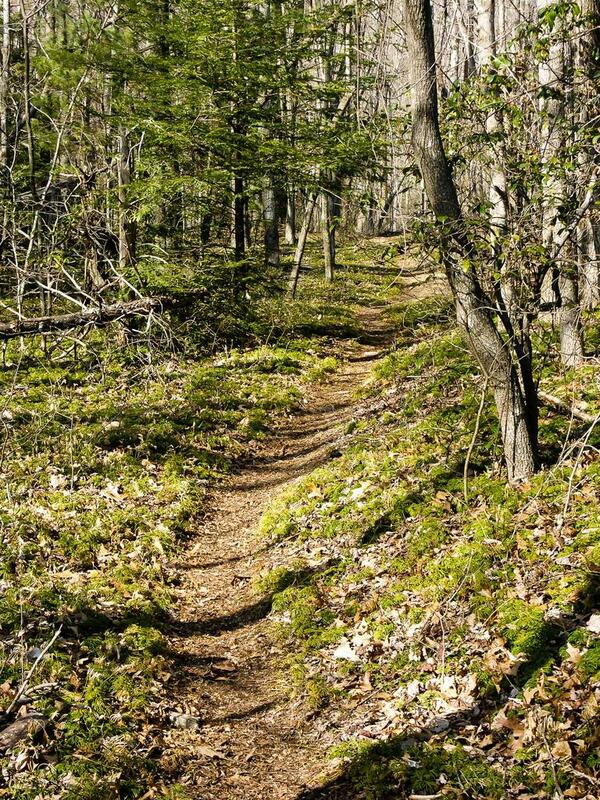 This is just an overview of the trails in the Preserve. 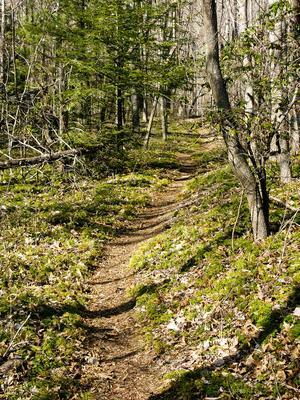 For all the trail details, be sure to visit the Trails page, and there are also two maps available on our Maps page. Here's a map of the Florence Preserve area. For more maps, including printed publications, see our Florence Preserve maps page. Take I-240 East toward I-40. Take US 74-A (straight) toward Lake Lure/Chimney Rock, NC. It's 13.9 miles past this junction to the Upper Hickory Nut Gorge parking area on the left. It's 0.9 miles past the Gerton Community Center and Nita and Susan's Country Store on the left. Look for the stone wall, stone chimney, and signs.